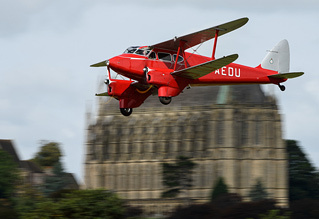 Nestled between the South Downs and the English Channel, and with an unrivalled backdrop of Lancing College and the chalk slope of Mill Hill to the North, Shoreham can justifiably claim to be the best family airshow in the UK, particularly following the sad demise of similar shows at Biggin Hill, Kemble and Manston among others. With its “unique garden party atmosphere” one can always expect an assortment of aircraft types, ranging from the primitive to the sophisticated - the old to the new. In 2014, with a 6-hour flying display comprising acts representing ages from WW1 right through to the modern front line, Shoreham really reaffirmed its position in the upper echelons of the UK airshow scene. Tom Lantaff reports for UKAR from beside the Adur estuary. Images as credited. If you are after value for money, Shoreham is the place to go. Priced at £18 for an advance either-day ticket or £22 on the gate, very few other shows offer half such a line-up for a reasonable entrance fee. Yet year on year Shoreham prospers with healthy profits from bumper attendances, testament to the fact that there is no need to charge extortionate prices to put on an airshow which get people returning for years thereafter. So what is it about this wonderful little show that makes it quite so popular? For starters, it is many a pilot's favourite airshow. The Breitling Wingwalkers, in some guise, have attended all 25 previous airshows, while well known display pilots such as Guy Westgate and Peter Teichman return without hesitation each year. Then a brief glance along the fence reveals a mass of families, the likes of which not seen at any other current UK airshow venue bar perhaps seaside shows. It's also worth considering that these shows, such as Bournemouth just along the coast which runs simultaneously, offer fun with a bucket and spade in addition to an airshow. Even without the Red Arrows who find the uneven local terrain prohibitive to completing a full display, Shoreham really has the edge when it comes to attracting such a large, varied and loyal crowd, whether it be down to price, location, quality and depth of aircraft on show, intimate relaxed atmosphere (not a stepladder in sight), entertaining commentary or simply profiting where other shows have fallen. The enthusiasts and seasoned airshow-goers are also there, but sporadically - far sparser than could be expected for such an impressive line-up. Shoreham certainly recognises its target audience, but meanwhile catering for all parties. It has the true recipe for success. As mentioned, the show frequently attracts the best in available UK family-favourite air displays, and this year was no different. 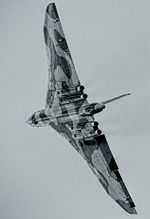 Notably Avro Vulcan XH558 brought with it the infamous 'Vulcan Effect' and sell-out crowds on Saturday, and those that did attend (or watched it on PlanesTV's excellent online live stream) will testify to how good the oft-maligned display routine was. 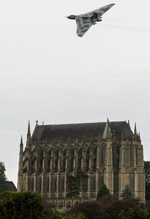 The RAF's pinnacle, the Eurofighter Typhoon set the babies and car alarms off with even more noise, the sound reverberating off Lancing College and surrounding hills adding to the spectacle, while the Turbulent Team provided some laughs. Displays which would be lost at larger venues come into their own along Shoreham's short, intimate display line. 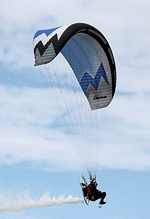 A lolloping display by a paramotor was a more than welcome show opening, as was GliderFX's genteel aerobatic routine to calming orchestral music. The Great War Display Team, with their seemingly uncoordinated mishmash of WW1 triplane, biplane and monoplane replicas are highly enjoyable at this venue, although people's attention noticeably increased on the announcement that Iron Maiden singer Bruce Dickinson was piloting his Fokker Dr1, before the sounding of the last post during the final Junkers CL1 touching down in a cloud of smoke aptly drew their set piece to a close. Even the RAF's diminutive Grob Tutor impressed, with this year's display cleared down to 300ft making for an altogether more eye-catching performance. A second area in which Shoreham really excels is with its historic and warbird content, so much so that we wonder whether it would actually be easier to move Shoreham to Duxford, such was the extent of this year's warbird contingent - no fewer than 15 Duxford residents or semi-residents headed down to the South coast for the weekend representing most of their major operators. So substantial was such a line-up that the loss of the Canadian Warplane Heritage Museum's Lancaster Mk.X to an engine snag went largely unnoticed, as did the unserviceability of The Fighter Collection's Grumman pair of F6F Hellcat and F8F Bearcat. 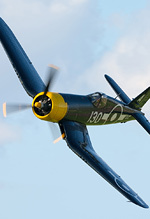 The Hellcat's display on Saturday was its first away from Duxford since its grounding in 2007, although Sunday's display was abandoned after takeoff due to a fuel leak. The first warbird action of the day was a trio representing Battle of Britain fighter command - that of a Supermarine Spitfire la N3200, Peter Vacher's Hawker Hurricane l (a genuine Battle of Britain veteran) and The Fighter Collection's Gloster Gladiator, initially as a trio before a short Gladiator solo and Hurricane/Spitfire tailchase. However the centrepiece of any Shoreham airshow is the 'Scramble', a thrilling set piece featuring sound effects, pyrotechnics and warbird fighters en masse. This year, in commemoration of the 70th anniversary of D-Day, the set piece was modified to simulate the aerial component of the allied landings in Normandy in 1944. 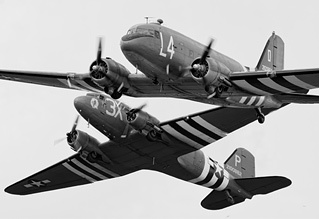 As such, two Hispano Buchons masquerading as Bf-109s took on a pair of North American P-51D Mustangs and a single Spitfire IXT, with a pair of Douglas C-47A Skytrains providing the overhead cover. The Buchons engaged the allied fighters in a superb 5-ship tailchase accompanied by air raid sirens and pyrotechnics on the ground before coming out victorious, with pilots John Romain and Cliff Spink performing a short celebratory formation aerobatic display. The sound of 5 Merlin engines accompanied by whistles emitted by both the Mustangs and Buchons is sheer brilliance, and one which will never get old, even if the entire segment lasted almost 20 minutes! It was also pleasing to see Peter Teichman back on top form in his Spitfire XI PL965, after uncharacteristically lacklustre showings in his Hurribomber at Sywell and Little Gransden. Rivalling Peter for the best warbird solo display were both Brian Smith in the Fighter Colletion's Goodyear FG-1D Corsair and the RNLAF Historic Flight's North American B-25J Mitchell which, like last year, was superbly flown. Everyone seemed on top form - even the BBMF's final pass on Saturday was the long arcing 3-ship topside which photographers had long been crying out for. The undoubted vintage highlight of the morning slot was Peter Greenyer's splendid De Havilland DH90a Dragonfly G-AEDU, now residing at Biggin Hill with the Shipping & Airlines fleet, having previously been under ownership of the Norman Aeroplane Trust. 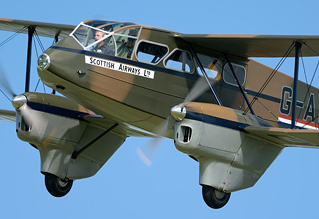 Often overlooked in favour of the DH89a Dragon Rapide, with which it tailchased, this is an all too rare airshow performer so it was welcome to see well known test and display pilot Dan Griffith at the helm, a far cry from the Hurricane he flew at last year's show! 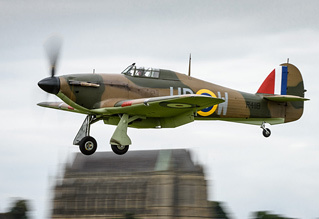 Like in 2013, Shoreham's policy when compiling the running order is to pack the morning's display with light aircraft and aerobatic routines, leaving a majority of the warbirds and highlights until nearer the end of the day. While there is nothing inherently wrong with this, and evidently such an afternoon's extravaganza is great for us enthusiasts, it simply doesn't always work as a family spectacle - many would argue it feels like two entirely separate shows. On Sunday at least, having Gladiator, Spitfire la & Hurricane l, BBMF, Peter Teichman's Spitfire XI, the D-Day scenario tailchase, C-47A x2, B-25 and B-17G 'Sally B' all as consecutive acts left people around me wondering when a change of pace was to occur (which it did, finally, with the Breitling Wingwalkers), indeed the number of spectators left to see Brian Smith's Corsair masterclass and the Blades finale was probably less than 50% the total gate. Therefore it would be great, just for once, to have some warbird action in the morning's flying to give the show more balance; surely nobody would disagree with an early Spitfire gracing the skies while the sun is still to crowd rear. The Gladiator/Spitfire/Hurricane trio, for example, would have been a perfect way to close for lunch - instead this honour went to the RAF Falcons, taking up a good 30 minutes of display time of which 25 minutes comprised tedious nothingness, punctuated by a similarly irritating commentator, almost usurping any overall enjoyment of an otherwise excellent jump. I say lunch tenuously as, while not a formal part of the air display, the 'lunch' hour was in fact reserved for a demonstration of radio-controlled miniature aircraft (we would be told off for calling them models!). Some treated this segment with indifference, taking the chance to buy some of the best food to be found at home airshows (an embarrassment to the disgraceful vendors found at the likes of RIAT and Farnborough) but those who did so will have missed an hour of flying synonymous with Shoreham's philosophy as a 'premier family airshow'. If the sight of a radio-controlled Extra 300 hovering was novel, the exciting 'Extra and model Extra' display which followed was certainly original and thus worthy of recognition and praise. Voted by UKAR as one of the Top Ten 'Airshow Moments' of 2013, this year Chris Burkett and Mike Williams appear to have refined the display to include a greater diversity of manoeuvres. Unorthodox? Yes. Impressive? Most definitely! I lack superlatives to adequately describe this year's show. Anybody attending over the weekend, Sunday in particular, will have left knowing they had witnessed one of the finest displays of the season, if not the best. Flying display director Rod Dean and his 400-strong team should be applauded for assembling an event which from start to finish was thoroughly engrossing, and one which would make the late Peter Eager, the show's founder, proud on this the 25th anniversary year of the inaugural show. Shoreham returns for 2015 over the weekend of the 22nd-23rd August and one thing is certain - if next year's flying display is half as good as 2014 then we are in for a treat.